When the kids and I go to the Nana and the Papa’s houses consecutively, as we often do for conveneince, we call it NanaPapalooza. 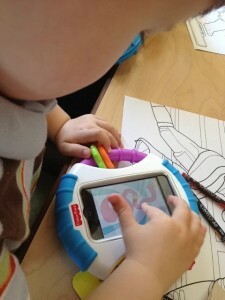 The first event was put on by Mommy Niri called Tots and technology. We all let the kids play with the i’s. You know, the iPhones, the iPads, the iTouches :-) Well Fisher Price makes these handy little covers that not only keep your devices safer but make them a little more kid friendly (as if that’s necessary). My 2 year old loved the iPhone cover and the 6 year old loved the iPad cover because it made it more portable – a carrying handle. 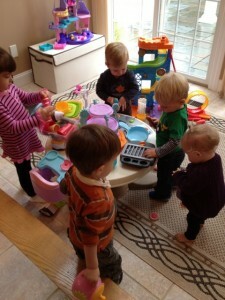 Then Charlene Chronicles had little bubby and I over for a Fisher Price playdate. She had lots of toys for the kids to play with that were really fun! Our favorite was the Little Peoples Wheelies Swoops and Hoops Amusement Park – FUN! With three kids we’ve had tons of toys pass through this house, lots of them Fisher Price. But it’s always nice to be reminded that new toys come out all the time and I should keep my eye out.